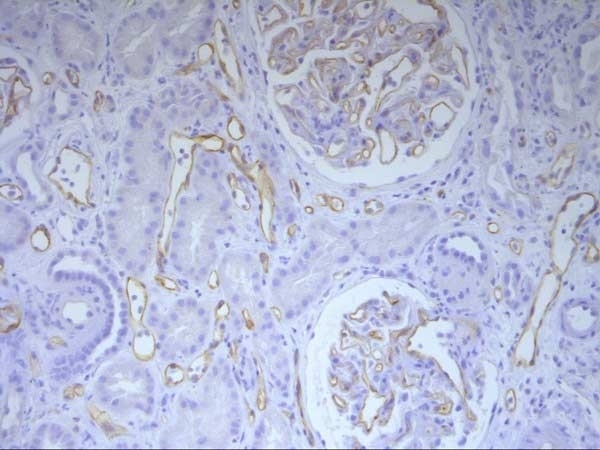 Immunohistochemical analysis of formalin fixed paraffin embedded human renal allograft tissue. Tissue was incubated with mouse anti human C4d (2222-8004) following heat mediated antigen retrieval. Mouse anti Human C4d antibody, clone 10-11 recognizes complement component 4d. The presence of C4d in renal peritubular capillaries is a key indicator for acute antibody-mediated rejection. C4d is a footprint of complement activation, making it a perfect maker of allograft rejection. Mouse anti Human C4d antibody, clone 10-11 recognizes the secreted protein complement component 4d (C4d). The presence of C4d in renal peritubular capillaries is a key indicator for acute antibody-mediated rejection [AMR] (Collins et al. 1999.). C4d was accepted in 2003 into the Banff classification for identification of acute AMR (Racusen et al. 2003). Mouse anti Human C4d antibody, clone 10-11 is specific for C4d, a marker that can be used in the detection of acute AMR for kidney, heart, pancreas and lung allografts. C4d is regarded as a key marker of antibody-mediated cell injury and humoral rejection (Sacks and Chowdhury 2002). Complement 1 complex cleaves complement 4 (C4) to form C4b and C4a. C4b levels are strictly regulated. Single site cleavage of the C4b’s alpha chain by Factor I forms iC4b and blocks C3 convertase, inhibiting opsonization and activation of the classical pathway. This requires C4 binding protein or CR1 as a cofactor. iC4b is further degraded into C4d and C4c. C4b’s short half life means that C4d is present in serum at high enough concentrations to make it a useful marker for classical complement activation (Collins et al. 1999). Mouse anti Human C4d antibody, clone 10-11 is used to detect the biomarker C4d which has been described as a “footprint” of antibody mediated tissue rejection (Sacks and Chowdhury 2002). The internal thioester of C4b becomes exposed during cleavage to C4d and forms a covalent bond with the cell surface. The longer half-life of covalently bound C4d makes it a footprint of complement activation long after weakly bound antibodies have been cleared by the blood stream (Sacks and Chowdhury 2002). C4 has also been linked to susceptibility to systemic lupus erythematosus (Yang et al. 2004) and rheumatoid arthritis (Makinde et al. 1989). 1It has been reported that this antibody works very well on acetone-fixed, frozen renal biopsies. Strong staining is observed in the glomeruli and in some cases the peritubular capillaries. Clone 10-11 has given variable results on formalin-fixed, paraffin-embedded sections. It has been observed that pre-treatment with 88% formic acid for 20 minutes at room temperature is beneficial (6). For best results Bio-Rad recommend HISTAR detection kits (STAR3000A/B/C). Mauiyyedi, S. et al. (2002) Acute humoral rejection in kidney transplantation: II. Morphology, immunopathology, and pathologic classification. J Am Soc Nephrol. 13 (3): 779-87. Collins, A.B. et al. (1999) Complement activation in acute humoral renal allograft rejection: diagnostic significance of C4d deposits in peritubular capillaries. J Am Soc Nephrol. 10 (10): 2208-14. Knechtle, S.J. et al. (2003) Campath-1H induction plus rapamycin monotherapy for renal transplantation: results of a pilot study. Am J Transplant. 3 (6): 722-30. Mauiyyedi, S. et al. (2001) Chronic humoral rejection: identification of antibody-mediated chronic renal allograft rejection by C4d deposits in peritubular capillaries. J Am Soc Nephrol. 12 (3): 574-82. Rogers, J. et al. (1992) Complement activation by beta-amyloid in Alzheimer disease. Proc Natl Acad Sci U S A. 89 (21): 10016-20. Troxell, M.L. et al. (2010) Pancreas allograft rejection: analysis of concurrent renal allograft biopsies and posttherapy follow-up biopsies. Rowe, P. et al. (2013) Increased complement activation in human type 1 diabetes pancreata. Diabetes Care. 36 (11): 3815-7. Johnson, R.K. et al. (2013) Acute tubular injury is an important component in type I acute antibody-mediated rejection. Roden, A.C. et al. (2016) Transbronchial Cryobiopsies in the Evaluation of Lung Allografts: Do the Benefits Outweigh the Risks? Arch Pathol Lab Med. 140 (4): 303-11. Verghese, P.S. et al. (2016) The clinical implications of the unique glomerular complement deposition pattern in transplant glomerulopathy. Troxell, M.L. & Lanciault, C. (2016) Practical Applications in Immunohistochemistry: Evaluation of Rejection and Infection in Organ Transplantation. Arch Pathol Lab Med. 140 (9): 910-25. Jain, D. et al. (2017) Detection of T and B cells specific complement-fixing alloantibodies using flow cytometry: A diagnostic approach for a resource limited laboratory. Asian J Transfus Sci. 11 (2): 171-9. Dugum, M. et al. (2014) Re-examination of sinusoidal deposition of complement 4d in liver allografts: experience from a single institution. Int J Clin Exp Pathol. 7 (2): 784-91. Sánchez-escuredo, A. et al. (2016) Borderline rejection in ABO-incompatible kidney transplantation. Clin Transplant. 30 (8): 872-9. Stoltzner, S.E. et al. (2000) Temporal accrual of complement proteins in amyloid plaques in Down's syndrome with Alzheimer's disease. Am J Pathol. 156 (2): 489-99. Sacks, S.H. & Chowdhury, P. (2002) Footprints of humoral rejection. Curr Opin Nephrol Hypertens. 11 (6): 627-8. Racusen, L.C. et al. (2003) Antibody-mediated rejection criteria - an addition to the Banff 97 classification of renal allograft rejection. Am J Transplant. 3 (6): 708-14. Yang, Y. et al. (2004) The intricate role of complement component C4 in human systemic lupus erythematosus. Curr Dir Autoimmun. 7: 98-132. Makinde, V.A. et al. (1989) Reflection of disease activity in rheumatoid arthritis by indices of activation of the classical complement pathway. Ann Rheum Dis. 48 (4): 302-6.